Ken Smith knows blackjack tournament strategy! There's no doubt about that. And with his new e-book, you too can learn the strategies that Ken has used to become widely regarded as one of the best tournament blackjack players in the world. If you've watched any blackjack tournaments on TV, you've seen Ken demonstrating his skills at the table, including his stunning $50,000 first place finish in the premier episode of the Ultimate Blackjack Tour(tm) on CBS. In this e-book, Ken summarizes many of the tournament playing and betting strategies that have appeared in his Blackjack Insider Newsletter column, plus he adds several new strategies that have never appeared in print before. You will learn all the tips and tricks that have made Ken the best and most feared tournament player. Whether you are a tournament novice or an experienced player at the game, this collection of articles will give you powerful new insights to take your game to the next level. 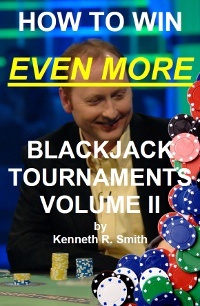 "My worst nightmare is to find Ken Smith on my table in a blackjack tournament. He has the uncanny ability to keep track of every player's chip count and then make a near perfect bet and playing decision. He is one hell of a tournament player." Henry Tamburin. 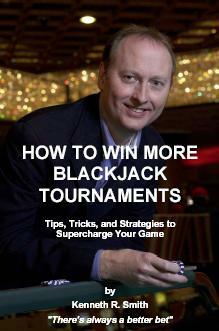 How to Win More Blackjack Tournaments is 98 pages with a full cross-referenced index. Once you place your order, you can immediately download the e-book to your computer where you can read it, or print a copy (either using your printer or at a local print store such as Kinko's). The e-book is only available in Adobe Acrobat format, and can be read with the free PDF viewer software, available from: http://www.adobe.com/products/acrobat/readstep2.html. Technical assistance is available for customers with questions (e-mail us at qus@bjinsider.com).